Canterwood is a gated community at Canterwood Golf & Country Club north of Gig Harbor. Canterwood features large, palatial estates and townhouses for sale with access to athletic courts, pool, and clubhouse, often overlooking the lush greens and fairways. This private neighborhood is about midway between Bremerton and Tacoma, both easily accessed via Hwy-16. 3 Beds | 2 Baths | 2312 sq. Ft.
4 Beds | 3.5 Baths | 3414 sq. Ft.
3 Beds | 2.25 Baths | 1428 sq. Ft.
3 Beds | 2.5 Baths | 2715 sq. Ft.
4 Beds | 4 Baths | 5207 sq. Ft.
4 Beds | 4 Baths | 5003 sq. Ft.
3 Beds | 2.25 Baths | 1751 sq. Ft.
4 Beds | 4.5 Baths | 3959 sq. Ft.
5 Beds | 5.5 Baths | 6250 sq. Ft.
Blue Summit Realty has the most accurate and up to date Canterwood real estate listings on the web. Currently there are 12 homes for sale, and 1 vacant land properties in Canterwood. Of the 13 total Canterwood residential listings for sale 0 are bank owned, 0 are short sales, 0 are new construction, and 0 are townhomes. The price ranges from $475,000 to $0 with a median list price of $899,582 and median sold price of $894,500. Make sure to refine your Canterwood real estate search by property type, price, square footage, bedrooms, bathrooms and more with the search tool above or view the Canterwood listings on our interactive map. 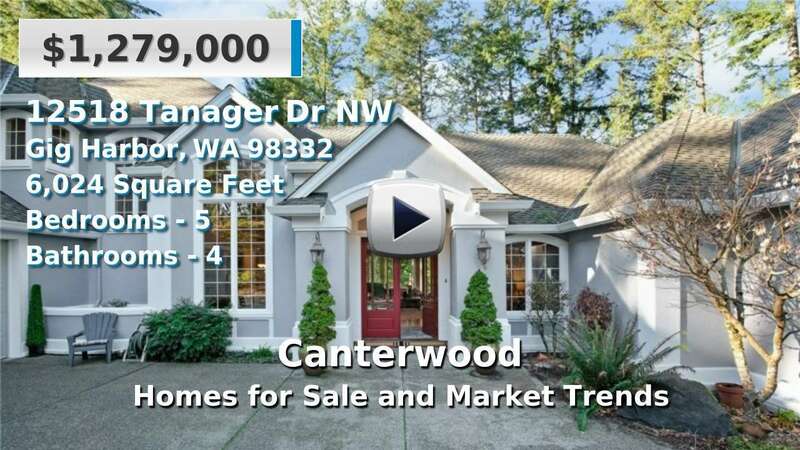 Our Canterwood real estate listings were updated 3 minutes ago.